You are here: Home / Life and Inspiration / Do you feel loved? Yesterday’s Headlines – Another student commits suicide. The report goes on : Shyamala Surve, a student in a college at Goregaon (Mumbai), allegedly committed suicide late last night by hanging herself from the ceiling fan of her house. In her suicide note, Shyamala said that she was not prepared for the exam and that was why she was committing suicide. From an interview with her parents, we learn that Shyamala had great dreams of becoming a Chartered Accountant. Her parents put no pressure on her to study. Shyamala was loved and cared for by them. Why would she want to die? Because, perhaps, she was not convinced that she was loved? Perhaps she felt she had to excel before she allowed herself to feel loved….I can only guess. But I can also learn from this….. I need to realize more deeply each day that I am loved. Each day I should try to be more and more conscious and grateful for the love in my life – love from God, my husband, my parents, my brothers, the extended family and my friends. 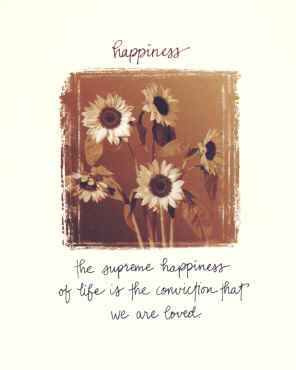 The deeper the conviction, the happier I will be…..the more I can reach out to others in love. Have you realised how lovable and loved you are? I am totally convinced that I am loved in many ways by the people around me and I am so grateful for that. What bothers me is the situation of people in countries like Somalia..And I am learning that you will not get answers to all your questions..